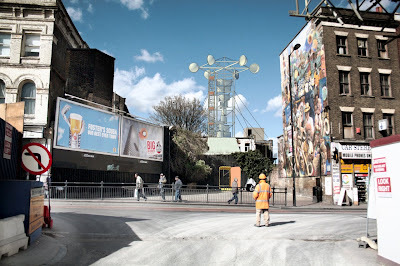 Dalston's derelict 'eastern curve' railway site has been reclaimed as public space under cover of the Barbican Gallery's 'Radical Nature' art exhibition. 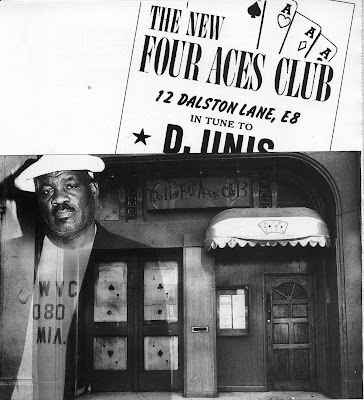 The site is now open for business with a series of afternoon and evening events until 2nd August including performances produced by Dalston's Arcola Theatre, Gahu Dramatic Arts, pedal powered music, the emergency urban psychoanalysis commando unit and other delights. Follow the links here for the programme. 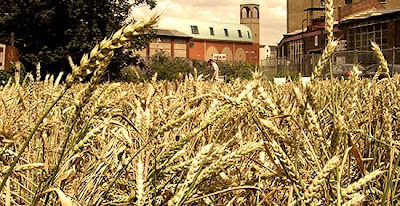 and part of the site has been planted with wheat uprooted from Lancashire and driven all the way to Dalston for replanting. 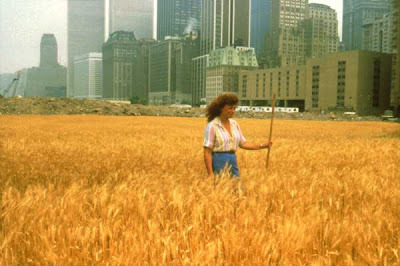 The wheat is to echo the iconic image of the wheatfield sown by Agnes Denes in 1982 to contrast with the towers of Manhattan. 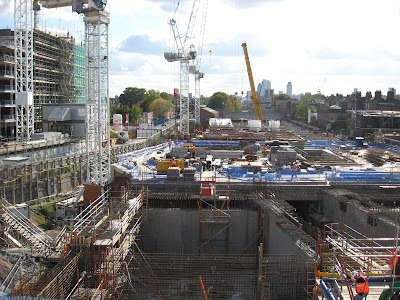 Meanwhile we're waiting to see if Barratt can afford to start the next phase of 10 - 20 storey towerblocks on The Slab in Dalston this October. The art installation is rumored to cost over £30,000 for the three week event and has received gushing press reviews - "artists are putting their shoulder to the wheel, trying to prompt the revolution in values and attitudes required to deal with environmental crisis". It will certainly provoke debate about radical and sustainable urban ecology. On this subject there are plenty of radical ideas about and some, like the new King Henry's walk community organic garden, are already happening. Dalston is really buzzing! 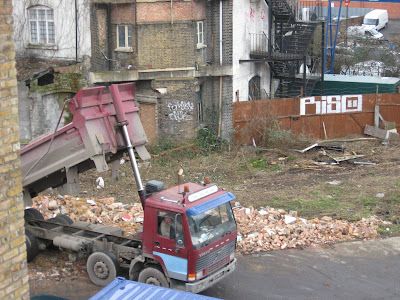 The site is owned by the public authorities and over recent decades has frequently been fly-tipped, squatted and stripped bare by human carrion of anything which could be sold. 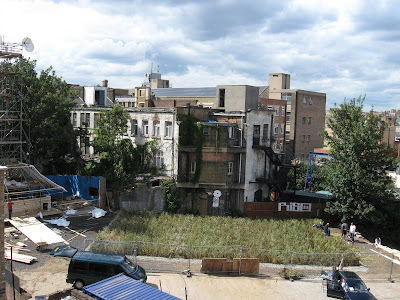 Backing onto the site is the Ashwin Street terrace of historic houses, left vacant and increasingly ruinous, and which includes the most recent old Dalston house to have been burned down in nine recent fires. 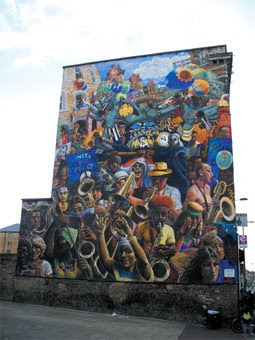 The entrance to the site is through a gate at the rear of Dalston's Peace Mural . 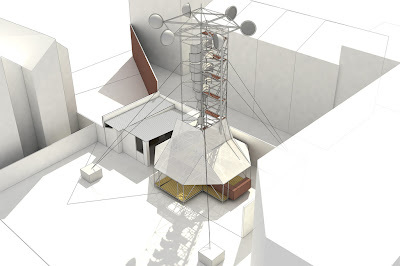 Lets hope the access and public use of the site will remain once the wheat is harvested and the windmill dismantled. PS: You will see a lot of new graffiti art is appearing around the site. PSst: Don't tell the Council - you know what enthusiasts their "clean up team" are.